Labels: halloween, kids, Miss E., Miss N.
"if you don't stop arguing with your sister, you won't get to do the manicure kit!" "clean your room or we will have to do the manicure kit without you". Needless to say rooms were clean and arguing was at an all time low. All week the girls kept asking to open the box, play with the kit, do it before Saturday, etc. but I held out! From the description: "Learn about cosmetic chemistry as you give yourself a magnificent manicure! Turn your hands silky soft with crystal mud and then soak them in a sea salt scrub. Create your own custom scent of lotion, buff and shine nails and much more!" On Saturday the girls were ready to go! Ms. N., Miss E. and I had fun with this kit. It was very easy to set up and follow directions. Time to Get Your Hands Dirty! - Create a gel based soaking solution for your fingertips or toes. My girls LOVED this. You slowly added water to crystal mud "flakes". The flakes went from expanding to a sugar like substance (gritty, fine) to a gel solution to dip your hands or feet into to soften and moisturize. By adding a little water OR a lot, you were able to see the flakes turn from a solid to a liquid. 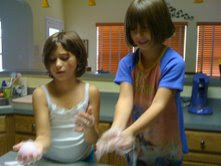 We followed up with a salt bath and our hands were soft and clean! Soften Up - We created lotion using a lotion base, fragrance and dye. We mixed everything up and tah-dah - Lotion we could use right away! 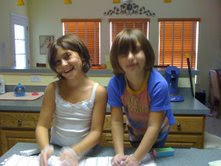 At this point my girls started wanting to play with the crystal mud and the pumice stone. I said Ok, don't make a mess, put the other items away and went upstairs to fold laundry. I felt confident that there were enough towels laid out that any spills would be contained. 15 minutes later Miss E came upstairs to the laundry room and said there was a "big mess in the kitchen". I came down and we had crystal mud ALL over the kitchen. Apparently the girls started arguing, and were pulling the bowl back and forth. The bowl won and went flying through the kitchen. 1/2 an hour and 24 towels later the mess was clean......You have to take blame where blame is due. Do I recommend this toy: Yes! The girls and I had a great time. Do I recommend this toy without supervision? No. Would I buy this toy again? Yes, absolutely! What I did like best as although this was fun we really were learning while using it. this is also an activity that can be done in a morning or an afternoon on a rainy day. This toy is so fun and educational that it actually won Creative Child Magazine's Toy of the Year Award in the Educational Toys category. This Magnificent Manicure Kit is part of Elmer's Science Explorer product line. This toy is recommended for 8 - 12 years old. You can see a full listing of products HERE. 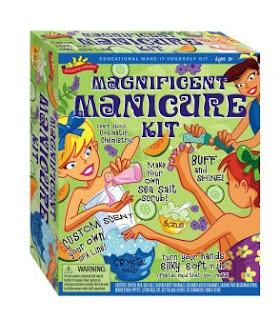 You can purchase the Magnificent Manicure Kit ToysRUs stores and at ToysRUs.com for $19.99. What a great deal! This blog post was done in partnership with TeamMom. Outside of receiving a product to review I did not receive any other form of compensation. For more information on this blog and my posting practices, please refer to the disclosure policy below.